Topbox has now introduced the Prive box for 2013 and instead of a regular Topbox for that month members have the option for picking a Prive Box (picked out of 3 different ones) and receive a box containing samples from one prestige brand, tailored to them based on their beauty profile. For January, all members received the same box, but in the future member’s will be able to select if they want to receive a Prive box or just the regular Topbox for that month. 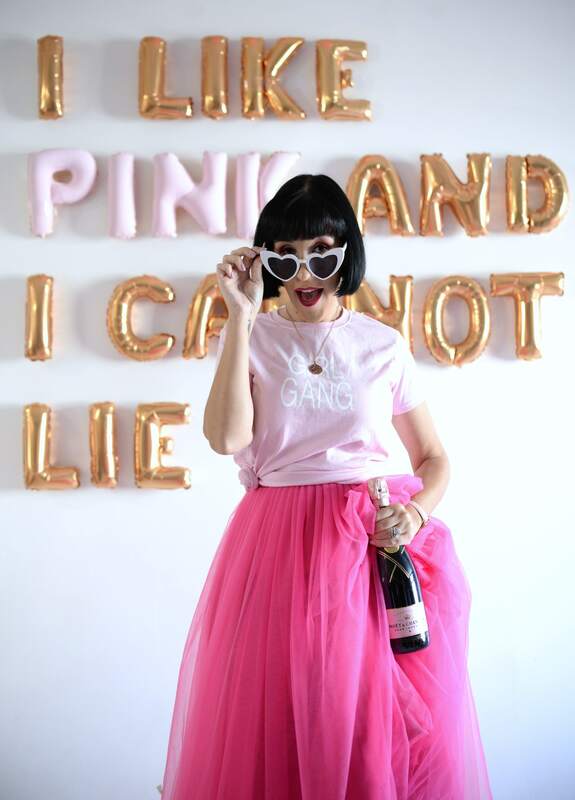 Clinique was the first brand to be featured through the Prive box and I couldn’t be more happier, I’ve been a huge Clinique fan for years. 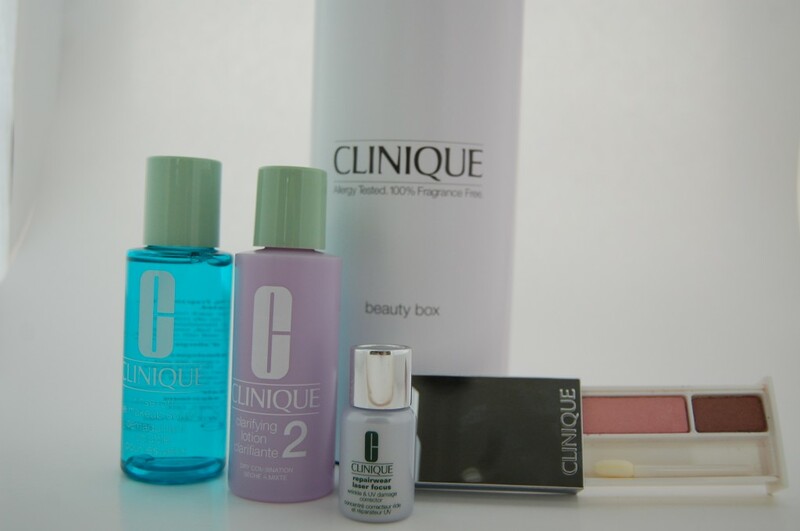 The Clinique Prive box contained four samples, all but one is deluxe/travel size. 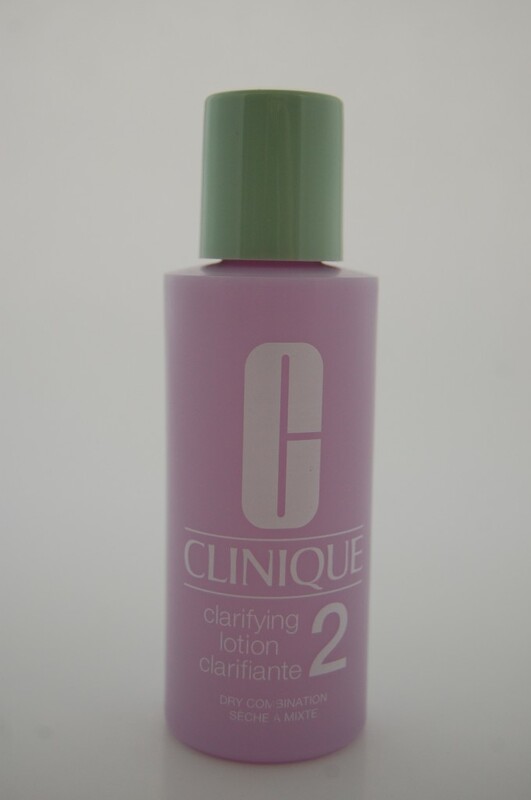 First up is their Clarifying Lotion which is formulated to help lift the world’s impurities to create healthier, younger skin. The full size bottle retails for $16/200 ml or $27/400ml, my sample size is 60ml putting a value on it of $4.80. I was happy to see it was for dry skin, which I have but if you don’t have dry skin I’m not sure how this would be helpful for you? Next up is their Rinse-Off Eye Makeup Solvent which make it a clean sweep, from lashes to brows or use for on-the-spot makeup fixes. It’s oil-free and retails for $25 for 125ml. My sample is 60ml putting a value of it for $12. I have the full size bottle of this already and really enjoy it, so this will be saved for when I’m travelling. 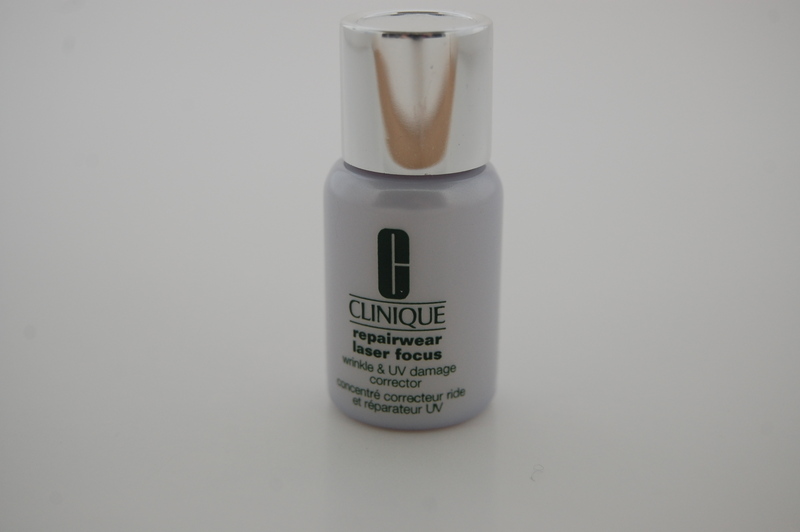 Third up is their Repairwear Laser Focus Wrinkle & UV Damage Corrector which gives your skin a second chance against sun damage and wrinkles. At 12 weeks, the visible wrinkle-reducing power is remarkably close to a dermatological laser procedure. 63% to be exact. The full size bottle retails for $57 for 30ml and my sample size is 7ml putting a value on it of $13.30. I suffer from sun damaged skin, so I look forward to giving this a try, although I have a feeling the sample size will be too small to even notice a difference? 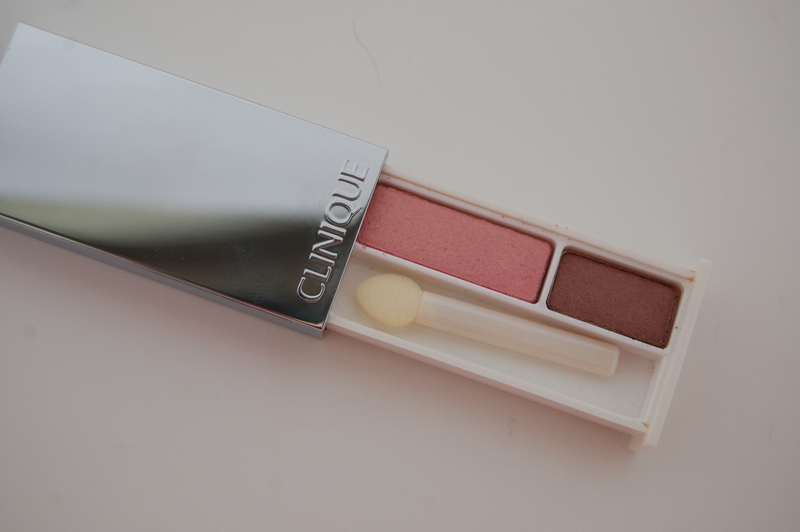 Last item is the Colour Surge Eye Shadow Duo in Strawberry Fudge; its go together shades of silky, easy-to-blend colour in a chrome slide compact and retails for $25 for the 2.5g package. My sample size is 1.6g putting a value on it of $16/1.6g. I’ve worn some of their eye pallets in the past and was never that happy with them, the color wears off quickly even with a eye primer, but I do love both these shades so hoping for good results? The total values for the Prive box is about $46, pretty good for only $12. The only problem I see with this box is that I’ve seen some of these products as gift-with-purchase, I think I’ve gotten a few of them in the past when I bought full size bottles of Clinique before, but still an okay deal for someone wanting to test this brand out first. You can now make your “wishlist” for February’s Prive Box if you like, your choices are Benefit, Lippy Girl or Miracle 10…. 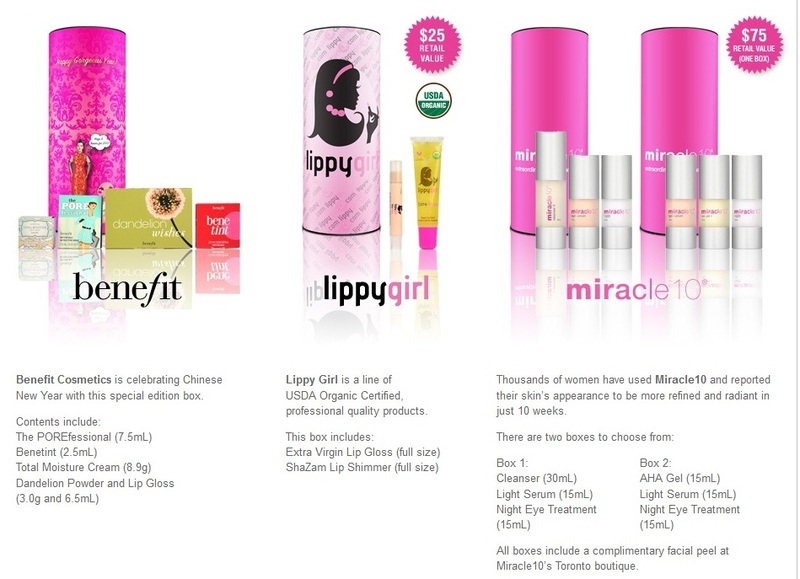 I think I’m going to pick Lippy Girl cause I’ve never tried it before but heard wonderful things about them?